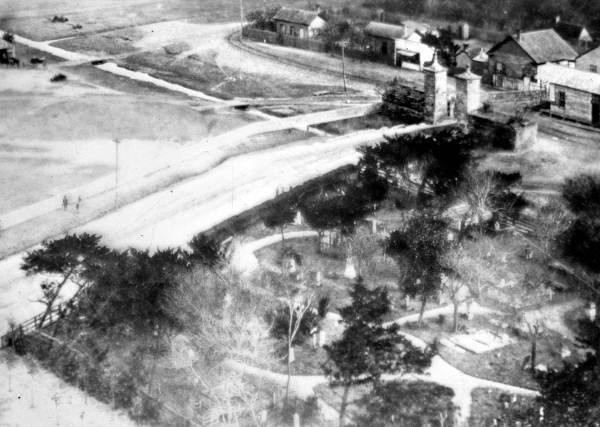 An overhead view of the Huguenot Cemetery taken in the late 1880s – probably taken from a tower at the San Marco Hotel. Courtesy Florida Memory collection. Ralph Waldo Emerson arrived in St. Augustine in January of 1827. He came here because the climate – especially in winter – was beneficial to his health. While here, he kept a journal recording his observations of the area and it’s people. There are two graveyards in St. Augustine, one of the Catholics, another of the Protestants. Of the latter the whole fence is gone, having been purloined by these idle people for firewood. Of the former the fence has been blown down by some gale, but not a stick or board has been removed, — and they rot undisturbed such is the superstition of the thieves. I saw two Spaniards entering this enclosure, and observed that they both took off their hats in reverence of what is holy ground. Emerson, Ralph Waldo, Edward Waldo Emerson, Waldo Emerson Forbes, and Bruce Rogers. Journals of Ralph Waldo Emerson, 1820-1872. Cambridge: Riverside Press, 1909. O’Sullivan, Maurice, and Jack C. Lane. The Florida Reader: Visions of Paradise from 1530 to the Present. Sarasota, Fla: Pineapple Press, 1991. Florida Memory at the State Archives of Florida.